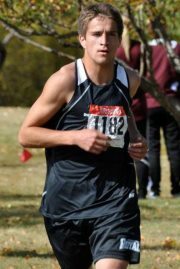 Hayden Hollowell continued his impressive season with a 6th place finish in the Junior Mens race at the Athletics Alberta Age Class Cross Country Championships in Edmonton on Saturday. The 17 year old, Beaverlodge runner clocked a time of 31:10 for the hilly 8 km course at Goldstick Park. Next up for Hollowell is the Athletics Canada National Cross Country Running Championships in Vancouver on November 26. Meanwhile, the GPRC Wolves X-Country Running team is in Kamloops next Saturday for the CCAA National Cross Country Running Championships. This entry was posted in Cross Country, Uncategorized and tagged Athletics Alberta, Beaverlodge, Cross Country, Cross Country Running, Grande Prairie, Grande Prairie Alberta, Kamloops, Wolves Athletics Club. Bookmark the permalink.